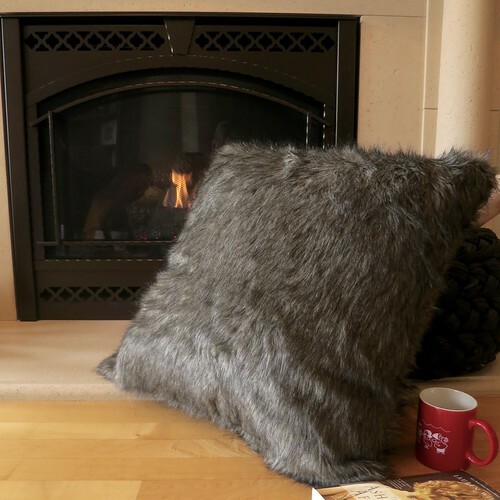 We have had a spectacular fall here in Minnesota, but we know that those cold days of winter are not far away. I’m looking forward to snowy days in front of the fireplace with a novel and a hot drink. 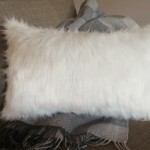 I decided to make things really cozy by sewing up a whole bunch of faux fur throw pillows. Seriously, doesn’t that look like the perfect spot to ride out a snowstorm?! These pillows were a cinch to make too since I didn’t bother with with zippers or anything. 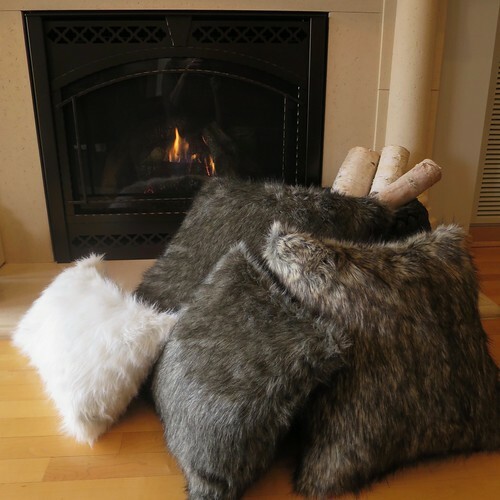 You can read my tips on sewing pillows with faux fur here. I got all my faux fur at Joann Fabric. It is really reasonably priced and they currently have some wonderful plush versions with coloring that is so realistic. I wanted something that will still work on the couch, but was big enough to use as floor pillow, so I ordered a 24″ x 24″ Two feet doesn’t sound that big, but next to my regular couch pillows it looks huge. 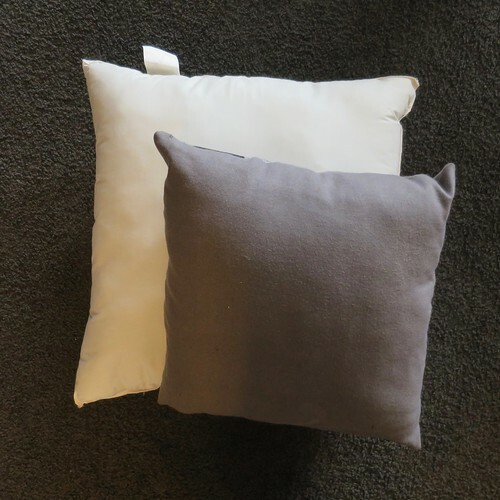 I decided to try the eco-friendly pillow which uses a plastic fiber fill made from recycled plastic bottles and covered in an unbleached cotton. This was a well sewn, tightly stuffed pillow which felt a lot better made than the typical inserts I buy. I’ve got to tell you guys, I love this new big pillow (though I am tempted to order a 40″ x 40″ now too). It’s great to find a new source for a supply that I use all the time. Pillowcubes is offering a 10% discount for readers of Just Crafty Enough. Just enter the code JustCraftyEnough10 when you check out. You can get an even bigger discount if you order inserts in bulk which is great if you make pillows to sell or as gifts. * Disclaimer: I was given a pillow insert by Pillowcubes to try, but all opinions of the site and the insert are my own. 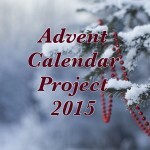 3 years ago by Kat in Home , Reviews , Sewing , Tools | You can follow any responses to this entry through the RSS feed. You can leave a response, or trackback from your own site. I am a big fan of these kinds of pillows and I paid a ridiculous price for just the one that sits on my couch. I’m definitely going to try making one as soon as I get the time to get the fabric. And thanks for the link to Pillowcubes. The prices seem reasonable. Thanks! 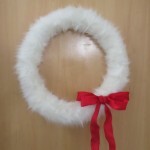 I know the price of the faux fur ones at places like Pottery Barn is crazy and you can make them so easily! PillowCubes is very over priced. Their “Free shipping” should really be “Shipping included in price” since you pay twice as much on the inserts then you would anywhere else including the cost of the shipping via any other company. When vacuum packing, that is to lower the shipping cost, but PillowCubes does not pass that savings on to the customer.